If you are a fan of MLS, then you fall in two categories: either you were going for LA and Beckham and Donovan and greater respect for the league when the "superclub" wins it all.... or you hate MLS's direction (Beckham included) and you wanted the Cinderella team to win it all. Yesterday it was Jason Kreis' team that won the battle, but they won it by chance and by the psychology of penalties and the well-poised Rimando. It is antifutbol, yes. This word has been coined in Latin American soccer media through the years as a way to describe overly defensive teams and penalty kick decisions. When given a chance, any psychologically motivated goalkeeper is tough to contend with. After riding high on last week's win versus Chicago, Nick Rimando was as sure of himself as Goycochea was for Argentina in 1990. It would require more power and placement than Galaxy players could. 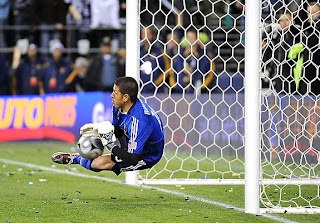 Landon Donovan, always so sure on penalties, was not to be undone by Rimando. And he wasn't. Instead, his first penalty miss in quite a while went over the bar. It is also true that although they may have felt an edge as favorites, the Galaxy star players looked tired and injured. 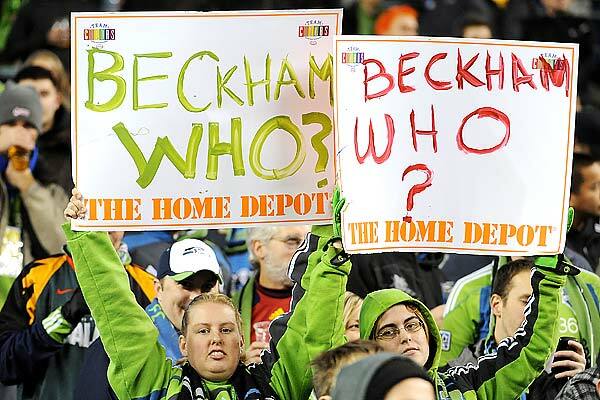 Such was the case of Beckham, who disappeared late in the game, and Ricketts, whose injury aided in RSL's equalizer. 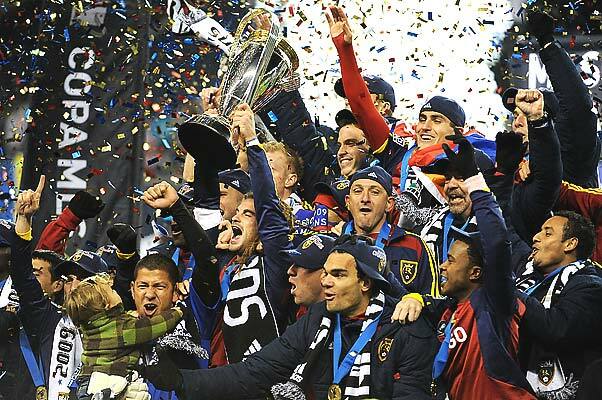 And then there's Real Salt Lake. A blue collar team, grassroots from its inception and full of young, hard-working talent. Jason Kreis may have been the apprentice compared with Arena, but he has now become the master. Out was Morales early in the game and constant was the pressure from the Galaxy attack. Movsisyan, Beckerman and Findley probed a fragile Galaxy defense often and hard... especially in the extra time. They held their ground, forced the tie, and eventually lifted the trophy. The penalties were just what they are supposed to be: a game of chance and psychology, the epitome of antifutbol. Salt Lake City now has a bona fide champion, a beautiful cathedral of a stadium and a fan base that isn't going away, not after yesterday. Maybe a designated player looms in the horizon--Blanco, I'm looking in your direction. For the Galaxy, it's back to square one, back to solidifying their defense, back to re-sign Donovan or search for another star to feed of Beckham, back to asking themselves if they really can become a superclub. Do you think they should just play on forever until someone scores or are penalty kicks a necessary evil? Unfortunately, because of the physical toil of soccer and scheduling of games, it's a necessary evil. Quadruple overtime in college football, for example, isn't as bad because they aren't constantly running.